In Japan, Cryptomeria japonica pollen (with diameter ~30 μm) is scattered during each spring season. Daughter allergenic particles, which are smaller in size than their parent pollen grain and are abundant in fine particles (the particle sizes < 1.1 μm, PM1.1), are released in the atmosphere. The daughter allergenic particles of pollen can be transported in the urban atmosphere for a long period of time after their release. In particular, the daily variation delays in the peaks of allergenic Cry j 1 concentrations compared with the peaks of airborne parent pollen counts were observed in high levels during 1 or 2 sunny days after rainfall. In addition, long range transportation of Asian dusts (ADS) from the East Asian continent was also found during the pollen scattering seasons in Japan. Therefore, the interaction between pollen and air pollutants, including ADS, should be of concern. 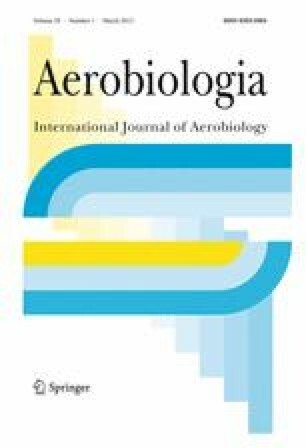 Thus, in this study, the morphological change of Cryptomeria japonica pollen and the elution behavior of its allergenic contents (Cry j 1) were investigated. Our results confirmed the existence of fine daughter allergen particles, which are clearly differ from the parent pollen grains in size. Fine allergenic particles in atmosphere were increased, while coarse allergenic particles were decreased on sunny days after rainfall. However, the correlation between the mass concentrations of fine particles and mass levels of Cry j 1 in coarse particles (the particle sizes > 7.0 μm) was poor. The possible reason may be pollen burst at high humidity before rainfall. Additionally, Cry j 1 contents were emitted from the so-called Ubisch body, which contains allergenic Cry j 1 abundantly when pollen was in contact with rainfall. In particular, we found that 60% of allergenic Cry j 1 contents released in air polluted rainfall contained Ca2+ ion derived from road dust and ADS. Therefore, rainfall should be a main factor to induce transition of pollen allergenic contents to fine particles. In conclusion, allergenic particles which are small sized and translated into fine particles by rainfall can be inhaled into the lower respiratory tract and contribute to the hypersensitivity of asthma. Some works of this study are supported by the Special Funds for Basic Research (B) (No. 17310031, FY2005–FY2007) and Innovative Area Research (No. 20120015, FY2008–FY2013) of Japanese Ministry of Education, Culture, Sports, Science and Technology (MEXT) and the FY2007–FY2008 Research project of Innovative Research Organization, Saitama University, Japan, Shanghai Pujiang Talent program, Innovation Program of Shanghai Municipal Education Commission (Grant No. 11ZZ80).